Late last year, James Dolan, the CEO of Cablevision and corporate overlord of the Knicks, Rangers, and Madison Square Garden, had his hands full battling Mayor Bloomberg’s plan for a football stadium when he was confronted with an even tougher task. It was probably the hardest thing he’d ever faced in his professional life. He had to personally tell his 78-year-old father, the estimable Charles Dolan, the company founder and chairman and a pioneer of the cable-television business, that as CEO, he could no longer support his beloved satellite offshoot and that it would have to be sold or terminated. The idea behind the venture, called Voom, had been to catapult Cablevision, a regional firm with 3 million subscribers, into the futuristic world of satellites, where no customer is out of reach. To Chuck, it was to be the crowning achievement of a storied career, perhaps his last hurrah. No son would wish to stand in the way of such a thing, certainly not one who, at the age of 49, lives next door to his father and calls him Dad around the office. On the 26th floor of 2 Penn Plaza, high above Madison Square Garden, Jim Dolan struggled to describe this strange and agonizing set of circumstances. Dolan does not, as a rule, speak to the press. He is excitable, prone to outbursts and tantrums, and he’s smart enough to know that doesn’t play well in the media. But he agreed to explain how he had entered into a predicament that may cost him his company. This is the first time he has spoken about his winter of discontent. 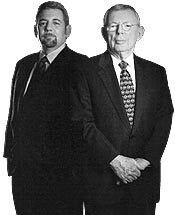 For years, Jim and the board indulged Chuck’s satellite dream; in 2003, father and son had even gone down to Cape Canaveral to watch the launch together. But in its first full year of operation, Voom had blown through $660 million, and an analysis showed no relief in sight. In the old days, that sort of bleeding might have been tolerable, but in the post-Enron/WorldCom era, board members have to be extra careful. They had received a legal opinion that they could be personally liable to shareholder lawsuits if they didn’t pull the plug. “At some point in December,” says Jim, “I had to tell him, ‘Look, I can’t vote for this anymore.’ ” How did his father take the news? “He wasn’t happy,” says Jim flatly, as if trying to shake the memory of a bad dream. To the surprise of nobody who knows him well, Chuck Dolan came roaring back. He asked for more time to come up with a financing scheme, but the board stuck to its guns and the original deadline passed. Then he invoked his powers as a special shareholder to rid the board of key Voom opponents, like the financier Steve Rattner, and replace them with supporters, including his son-in-law. He hastily put up his own Website as counterpoint to the official Cablevision site. He was, in a sense, attempting a hostile takeover of his own company. It has been a decade since Jim Dolan was installed by his father as the CEO of Cablevision. Though the stock is publicly traded, the Dolan family exerts control through a special class of shares, and until recently tended to do as it pleased. The Dolan family holds $1.5 billion of Cablevision stock; according to a recent Securities and Exchange Commission filing, over the past fourteen months, Jim has taken home a salary and bonus totaling $9.5 million, while his father has made $6.8 million. Throughout Jim’s tenure as CEO, there has been rampant speculation about who was really running the show. Especially early on, few believed that Jim, who had a history of substance abuse, a hair-trigger temper, and a taste for leisure-class pursuits like competitive yachting, was anything more than his father’s compliant proxy. In early January, when I asked Wall Street analysts who was really in day-to-day control of the company, the father or the son, few could answer with any certainty. “The problem is, we don’t really know,” said Richard Greenfield of Fulcrum Global Partners. At Madison Square Garden, which Cablevision took full control of in 1997, along with its two resident teams, the Knicks and the Rangers, Jim has always been out in front. Cablevision has spent lavishly on both teams, but often in quick-fix ways that have failed to produce winning records; this year, the Knicks are floundering again, while the hapless Rangers aren’t even playing because of the NHL lockout. Dolan, as a consequence, has become a favored whipping boy of the sports press, alternately savaged and ridiculed, sometimes both at the same time. That seemingly weak public stature did not, however, deter him from taking on Mayor Bloomberg and his football stadium. The project galls Jim. He can’t fathom the audacity of the mayor and his deputy Dan Doctoroff in proposing to build a publicly subsidized stadium for the Jets just a few blocks west of the Garden. It’s competition, Dolan believes, and if it were a private project, he would have no choice but to live with it. But how can he be expected, as he puts it, “to compete with your own government”? As Bloomberg prepared to maneuver the stadium through a series of political loopholes, Cablevision responded with a barrage of hectoring ads and then crashed the party with its own plan for developing the site, throwing the project into doubt and turning the mayor into a sworn and possibly vengeful adversary. When Jim Dolan was a young man, the last thing he wanted to do was follow his father into the family business. In fact, he didn’t want to be in any business at all, maybe because he sensed that it would prevent him from ever escaping his father’s shadow. His dream then was to be a rock star. Now, this dream deferred (though not dead—more on that below), he is on a very different kind of stage, sharing it with two powerful men, Michael Bloomberg and Chuck Dolan, who see him as an impediment to things they want very badly. The Hollywood Reporter once described Cablevision as “the North Korea of the cable business. No one understands what they are doing, but everybody is concerned.” The House of Dolan is content to keep it that way. They make certain their senior managers who quit or are fired—and there have been plenty—are bound by severance packages from talking publicly about the company or the family. In person, Jim Dolan is very direct; subtlety is not his art. He is five foot six, built like a fireplug, and has a well-groomed goatee. On the day I met him at his office, he was wearing dark slacks, a black polo sweater, and loafers with metal buckles. His voice is raspy, part Charles Rangel, part Sunrise Mall, and he speaks in an animated fashion, constantly shifting in his chair, smiling broadly one second, frowning deeply the next. Every now and then, a slight temper flashes in his eyes. By the fall, Cablevision was bankrolling a flurry of ads, tying the $600 million of public investment in the project to subway-fare hikes and shortfalls in education spending. These ads attacked Bloomberg where he is most vulnerable politically, using the examples of hardworking waitresses and firefighters to underscore the message that the billionaire mayor is trampling over the concerns of ordinary people. With his father’s support, Jim went to the Hazelden clinic in 1993. But his former life won’t completely go away. Robert Astarita, who headed Cablevision security for eighteen years until 2002, contends in a 415-page sworn deposition that in the early nineties, before Jim was CEO, he was ordered by Chuck Dolan and John Tatta, a now-deceased co-founder of Cablevision, to search Jim’s office and home for drugs. He claims in the deposition that he found some, and it was not long afterward that Jim entered Hazelden. Astarita is suing Cablevision to recover $1.5 million in severance he says was unfairly withheld. According to Cablevision, the severance wasn’t paid for a very simple reason—Astarita took two television sets and put them in his garage. Astarita acknowledges taking the sets but says he brought them home for safekeeping after layoffs left his department in turmoil. When Chuck Dolan’s nascent cable company won the rights to wire all of southern Manhattan in 1965, most people scoffed at the idea that anyone would pay for television. Chuck saw it quite differently. He sensed that there was an appetite and a market out there for far more than a few measly TV channels, and he had prescient ideas about how to feed that market. With the 1972 airing of a polka party from Pennsylvania, he gave birth to the channel that would one day introduce us to Carrie Bradshaw and Tony Soprano: HBO. For all his foresight, though, Chuck Dolan was not always able to realize the long-term gains of his innovations. Years before HBO became the cultural juggernaut (and cash cow) it is today, Dolan lost control of it. He and Time Inc. had been partners in his original cable company, called Sterling Manhattan Communications, but Time Inc. didn’t have the nerve to keep investing in such a costly, speculative enterprise. So it gutted the company, jettisoning everything except the Manhattan cable franchise and HBO. It was a punishing setback, but Dolan recovered. He organized a new company, which would become Cablevision, and used a big chunk of his own savings to buy back as many of the cable franchises as he could. But HBO, and its fabulous potential, had slipped out of his hands for good. Jim drifted through two colleges before landing at SUNY–New Paltz. It was there that he had an epiphany of sorts. He was taking guitar lessons from a gifted musician who had played for years but was still teaching college kids for $5 an hour. That did not look like much of a future to Jim, certainly not compared with Dad’s growing business. So Jim switched majors to communications, and a few days after graduation, went to work for the family company. 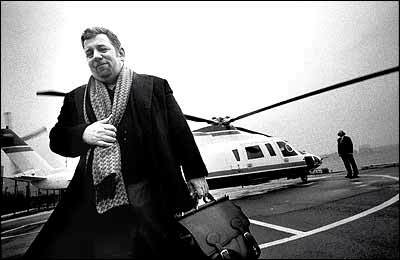 Jim Dolan also distinguished himself after 9/11, taking a leading role in organizing the “Concert for New York City” at the Garden and in ensuring that the money raised was properly accounted for. But Jim Dolan has had his share of misadventures. Pursuing a goal of Cablevision as an integrated entertainment giant, he purchased the bankrupt Wiz stores and the Clearview Cinemas chain. The Wiz was a flop, posting losses of more than $250 million before it was liquidated, and Clearview has added little to Cablevision’s bottom line. Then there are the Rangers, the Knicks, and the Garden. When Cablevision assumed full control of all three in 1997, it was considered a triumph for the company, a shiny Manhattan trophy that fortified the company’s sports programming, a critical component of cable television. And the teams would be fun for Jim, who grew up a passionate Rangers fan. Owning them was the realization of a dream. The intervening years have been closer to a nightmare. The Rangers and Knicks have been afflicted with oddly similar pathologies; salaries are gigantic, but talent is thin and management scattershot. The Rangers haven’t made the playoffs since 1997; the Knicks have fared better, but are light-years away from serious contention. The sports world, not to mention the team’s hard-luck fans, has become bitterly critical of the Dolans. “Over the last six to eight years, they have been among the worst-run franchises in all of professional sports,” says Marc Ganis, a Chicago-based sports-industry consultant. There are not many owners, however, who have also gotten mixed up in as many team-related spats as Jim. At practically every step, he has been feuding with somebody. The company has battled the Yankees and Mets, arguably costing Cablevision opportunities to be partners in the teams’ new regional sports channels. He also dumped the Garden’s signature voice, Marv Albert, opening the door for the Nets to scoop up the legendary play-by-play man. (When they move to Brooklyn, having Marv onboard will be an enormous aid in competing for New York fans.) And he is once again warring with Time Warner Cable, which has resulted in Knicks telecasts being unavailable in much of the New York market. “You have to sit back and wonder: Do these fights make sense?” Ganis says. In the Garden executive suites, Jim is known for blowing up at subordinates, and there has been a steady exodus of senior managers who have quit or been pushed out the door. Just last October, Jim erupted when presented with the estimates for the hockey broadcast costs on the MSG Network in 2005, which projected a fairly dramatic increase. What his managers tried to explain, as he bellowed at them, was that the 2004 figures had been artificially low because of the NHL lockout (no hockey games to show), and the expectation was that games would resume in 2005. Soon after the meeting, Mike McCarthy, the president of MSG Network, resigned. Dolan felt decidedly less terrible for letting Marv Albert walk, which stung longtime Knicks fans. To them, Albert represented the continuity of the team, the precious link between past and present. He was the fan’s advocate, not a company man, and he held the team to a high standard. To Dolan, Albert was an overpaid ingrate who loved trashing the team. 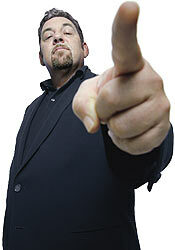 “His basic attitude toward the entire company was ‘Screw you,’ ” says Dolan. And that’s how Marv Albert became history. Jim has always taken pains to construct a vigorous life outside the office. He seems driven to rack up accomplishments that might distinguish him from his father. He became, for example, a sailing fanatic, entering serious competitions, including one where he spent fourteen days skipping across the Atlantic in a stripped-down craft that had no windows, beds, toilets, or running water. He poured millions of dollars into the effort, hiring the best boat designer and builder, assembling a crew of about twenty sailors, and flying them on the Cablevision jet to regattas around the world. (He says the company was reimbursed.) Unlike many of the tycoons who assemble racing teams, Dolan “liked to steer his own boat,” says Chris Kam, a crew member. But not long after a frustrating regatta in Sardinia, in which he dropped out in the middle of the last race, Dolan disbanded his crew, got rid of the yacht, and quit the sport. For Dolan, the music has also been a useful distraction from the chaos of his business life. Not that all the news has been bad. His battle with the mayor is going pretty well, proving that in politics, unlike in, say, basketball, money really can buy results. Cablevision has spent more than $22 million on advertising and lobbyists fighting the stadium, plunging Bloomberg’s and Doctoroff’s neatly conceived plans into disarray. While the Knicks stumble and the Rangers sit idle, Jim seems to have found a game he’s good at. If Chuck is really mad, he could strip Jim of his CEO duties, but still leave him with the Garden. Or he could strip Jim of everything. Nobody really expects that to happen, but then nobody has ever really understood what goes on inside Cablevision. I asked Jim what he thought of the possibility that his father will dissolve the company. You have no insight into what he might be planning?